The Organizer (Italian: I compagni) is a 1963 Italian-French-Yugoslavian-produced drama film written by Mario Monicelli and Age & Scarpelli, and directed by Mario Monicelli. Set in Turin at the end of the 19th century, it stars Marcello Mastroianni as a labor activist who becomes involved with a group of textile factory workers who go on strike. 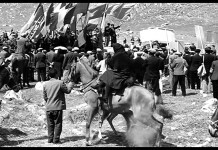 The film had its premiere at the 35th Congress of the Italian Socialist Party. The script was nominated for Best Original Screenplay at the 37th Academy Awards. The film is set in Turin at the end of the 19th century and opens with a scene showing workers of all ages, including young teenager Omero (Franco Ciolli), rising at 5:30 in the morning before heading to a textile factory where they work until 8:30 in the evening. Towards the end of the day, fatigue starts taking its toll and disaster strikes when the hand of a drowsy worker is mangled by a machine. Workers Pautasso (Folco Lulli), Martinetti (Bernard Blier), and Cesarina (Elvira Tonelli) decide to form an ad hoc committee and speak to management and state their case that the 14-hour work day needs to be shortened by one hour to avoid accidents arising from exhaustion. Their request is ignored and they only admonishments to be more careful. Moreover, a subsequent attempt by the workers to emphasize their grievances by staging a walkout an hour early on the next evening results in a humiliating defeat when they lose their nerve and stay until the usual time. Professor Sinigaglia (Marcello Mastroianni), a labor activist on the run from the police in Genoa, hops off a freight train and comes to hide in the neighborhood. There, he runs into a meeting where the undeterred workers discuss the idea of all coming to work an hour late to make their point. The bookish-looking, unassuming Sinigaglia becomes involved, and in a burst of fiery rhetoric persuades the workers to escalate their struggle by not coming to work at all and going on strike instead. Drawing on his own experience, he also helps them to prepare effectively by building up a stock of supplies. The workers committee expresses its gratitude by assigning Sinigaglia as a guest to Raoul, a bitter worker who is skeptical about the others’ determination as well as the movement’s chances of success, and is displeased with this arrangement. After a failed attempt at inducing the strikers to resume work by granting token concessions without shortening work days, management proceeds to bring in workers freshly laid off by another factory to take over. 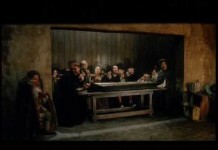 A confrontation ensues between the strikers and the replacement workers, resulting in Pautasso’s death. This tragedy draws the attention of the press and the government, forcing the factory owners to send the replacement workers back home. However, the police also manage to track down Sinigaglia to Raoul’s home, sending the professor on the move again after a narrow escape. As the duration of the strike reaches a month, the factory owners are suffering severe financial losses and are close to giving in. Unaware of this and suffering from both low supplies and a low morale, workers meet and vote to end the strike. Sinigaglia then reappears, delivers yet more fiery rhetoric and convinces them not only to keep striking but to escalate the movement by occupying the factory. In a showdown between the strikers and an army unit dispatched to block access to the premises, soldiers fire into the crowd, killing Omero and sending the others fleeing. Sinigaglia is arrested by the police, and Raoul has to go into hiding after attacking a police officer. 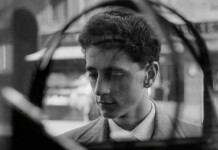 The film’s end mirrors its beginning: the grim-faced employees are shown crossing the factory gates to resume work, with Omero now replaced by his younger brother (whom Omero had hoped would obtain a better education and escape the fate of factory workers). Meanwhile, Raoul hops on a freight train to find shelter with a member of the underground labor movement in another city, and is now determined to pursue the struggle.